Today Flashlight Commentary is pleased to welcome author Evan Ostryzniuk to discuss his latest release Of Fathers and Sons: Geoffrey Hotspur and the Este Inheritance. To start things off, please tell us a bit about Of Fathers and Sons. It is a pleasure to be here. The novel is the second in the English Free Company series set in the High Middle Ages. This time around, company head and wayward squire Geoffrey Hotspur gets involved in the struggle for control of the northeastern Italian city of Ferrara in 1395. Two members of the famous Este family are claiming the right to be the next marquis – 12 year-old Niccolo, the illegitimate son of the late marquis, and his uncle, the veteran captain Azzo. Of itself, such a struggle for power was the norm in medieval Italy, but what sets this particular conflict apart is how Ferrara finds itself in a strategic position for control of northern Italy. At the moment, a fragile balance of power is keeping the peace, but whoever controls this city will have a crucial advantage to dominate the region. In addition, as the title suggests the story examines the relationship between fathers and sons. Both Niccolo and Geoffrey are orphans; both are insecure because of their unfortunate provenance; both feel the weight of their real or adopted fathers’ legacies on their consciences. Much of the action revolves around how these orphan boys, having been cast in the political or literal wilderness, try to live up to their names in a hostile world. They have to grow up fast or be forsaken. I was inspired to write the English Free Company series by the remarkable intensity of life that I discovered in the late Middle Ages. An astounding number of events came fast and furious during this time, and so as a means of bringing this unique period to life, I set an orphan squire into the thick of it. Canterbury Tales was written at this time. As for Of Fathers and Sons specifically, I had wanted to explore the role of children in the 14th century, and the opportunity arose when the Este inheritance came at the right time in the chronology of the series. For those who do not know, Niccolo d’Este grew up to be one of the great men of the Renaissance, and served as a prototype for Machiavelli’s The Prince. In many ways, which my novel reveals, his character was set during those tumultuous months of war with his uncle. What research went into Of Fathers and Sons and what, if any challenges did you face in adapting your research to fiction? Books. Lots and lots of books. I had to investigate many aspects of the Middle Ages in the broad sense and also make detailed studies of the specific events portrayed in the novel. I made sure to cast my net widely in order the gather in as much arcane knowledge as possible. I was trained as a professional historian, and so I know as well as anyone the immense amount of research needed to create a convincing narrative. I collected chronicles, academic studies, period letters and reports, pictures, jokes and tales, and even practical guides on how to perform the most basic tasks. For example, everyone knows what a suit of armor looks like, but how many people know how to put it on properly, from under garments to gauntlets? This is important to my novels especially, because several of the main characters are soldiers, meaning what they wear to battle is of critical importance. The greatest challenge in adapting my research to fiction was doing the dialog. Nobody spoke then as they do know, of course, but also the use of language was quite different. People of the Middle Ages possessed a verbal dexterity that would astound listeners today. They used many more natural metaphors and religious allusions than we do. Modes of address were determined based on one’s rank in society. The language had a specific rhythm, and so people would often speak in rhyme and alliteration. People of the Middle Ages also liked a good joke, and so a certain humor was embedded in language. So, I endeavored to include these nuances in the dialogs of my characters and yet make the language accessible to the modern reader. I employed some period terms and words, especially amusing curses, but all the time I had to ensure that the speeches were neither awkward nor stilted. And then there was the task of keeping as much modern vernacular out as possible without resorting to primitive conversations. I have a number of dictionaries to help with this. As well, each character must have his or her own voice! Of Fathers and Sons is a sequel to Of Faith and Fidelity. How does this book differ from its predecessor? The books differ in events and themes. Of Faith and Fidelity is about a conflict between rival popes and how religious sentiment can color one’s decisions when fundamental beliefs are challenged. Of Fathers and Sons, although set just one year thereafter, concerns the purely secular struggle between rival branches of the same family for the Marquisate of Ferrara and examines the nature of patriarchal relationships. Also, the first book contains a lot of crises of conscience, and so many of the decisions made bore a heavy moral or ethical weight. In the second novel the characters are all trying to get ahead of the game and scheming for advantage. That is not to say that Of Fathers and Sons is light in tone; rather the stakes are different this time around. What scene posed the greatest challenges for you as an author? The scene that posed the great challenge was the confrontation between Niccolo and his uncle in the town hall in Bologna. Until that point, they had never seen each other, but Niccolo feared him all the same. Niccolo’s speech is a moment of catharsis, a turning point in the story, and so it had to be done just right or the house of cards would fall. The scene had to reflect many things within a short burst of text – the tension in the hall, Niccolo’s uncertain mood and insecurity, the location of the other players relative to him, and most of all his speech had to contain both rehearsed and spontaneous elements. It contains more theatrical than literary elements. In addition I had to reproduce the voice of a child on the cusp of adolescence who has the weight of the world on his shoulders yet has never spoken in public. It was a delicate balancing act, since I had to be very careful with the words, inject not just simmering emotion but shifting tones as well, while keeping the reader guessing as to where it would all lead. And all this in the absence of a detailed source. What the historical record shows is that both sides attended a peace conference in Bologna during the winter of 1395, which had a set of dramatic consequences. So, I had to extrapolate from these consequences, as well as from the anticipation prior to the meeting, the likely tone and content of Niccolo’s speech. If you could sit down and talk with one of your characters, which would you choose and why? That is a tough question. I created each character so that he or she would be not only very different from any other by rank, skills and temperament, but also have their own unique histories and skeletons in the closet. However, if I had to choose, I would like to get to know Catherine the Astrologer a bit better. She comes across as the most worldly of the lot, and because of her outré social status, she must have a great many interesting and revealing stories to tell about where she came from and how she became so successful as an independent agent. Keep in mind that this was very much a man’s world, where women were broadly considered dangerous and inferior. Actually, I do know Catherine’s origins, but readers will have to wait until the next novel to find them out! And her profession gives pause to wonder. The practice of astrology during the Middle Age is one of those strange things that are difficult to account for. The Church was against the practice, for obvious reasons, yet many popes and kings kept astrologers on the payroll. Astrology was respected as much as suspected, and tangentially associated with witchcraft. Plus, Catherine seems to find herself at the heart of medieval politics time and time again. How is that? And why is she not married? Also, she keeps her (tarot) cards so close to her chest that it would be a challenge to draw her out. Geoffrey Hotspur, on the other hand, would spill all about himself at the drop of a hat. I hope that readers will come away with a greater appreciation of the High Middle Ages. Not many authors write about this period, although in many ways it is more interesting than the better known Tudor or Roman centuries if only for the sake of its immense diversity of experience. The 14th-15th centuries represent the extremes of medieval culture, a transitional period that went a long way towards shaping the modern world. The weight of history is palpable at this time. I would also hope that the main characters make a strong impact on their readers, for I carefully sculpted them as representatives of this dramatic time. While they should be sympathetic figures, they should simply not fit in our world. I want those who crack open the book to find themselves drawn wholly into those raucous times. I will soon be starting the third installment of the English Free Company series: Of Crosses and Crescents: Geoffrey Hotspur and the Last Crusade. In addition, I will be writing a number of short stories and assorted vignettes showcasing the various members of the English Free Company. However, before that I will on virtual and real tours in support of the latest adventure. Of Father and Sons in paperback comes out in September. About the Author: Evan Ostryzniuk was born and raised on the prairies of western Canada. After graduating from the University of Saskatchewan with a B.A. in History and Modern Languages and an M.A. in Modern History, Evan crossed the ocean to do post-graduate work at the University of Cambridge, concluding four years of research with a doctoral thesis on the Russian Revolution. He then found his way to Eastern Europe, where he took up positions as a magazine editor, university lecturer and analyst in the financial services sector before rising in the ranks of the local publishing industry to become Editor-in-Chief of a popular weekly. Evan Ostryzniuk currently resides in Kyiv, Ukraine near a very large candy factory. He has travelled extensively, including the locations of his novels. Of Fathers and Sons: Geoffrey Hotspur and the Este Inheritance is his second novel. For more information, please visit Evan Ostryzniuk’s website. About the Book: Geoffrey Hotspur, orphan-squire and ward of the powerful John of Gaunt, Duke of Lancaster, longs to return home to France. Having fought in the ranks of the now disbanded papal armies in Italy, he finds himself penniless and stuck in a foreign land far from his native Avignon, with only a resentful and unscrupulous debt collector as companion. Above all, though, Geoffrey fears losing his place at court, and so he must make his way back to the halls of Gaunt or risk being forsaken by the only family he has known. Twelve-year-old Niccolo, the new marquis of Ferrara and heir to the strategic lands of the Este family, is under siege. His right to the throne is being contested by his uncle. Outnumbered and insecure because of his questionable legitimacy, Niccolo must gather an army of his own. When the paths of the errant squire and troubled marquis cross, their fates intertwine as each endeavors to take from the other what he needs. Geoffrey Hotspur, orphan-squire and ward of the powerful John of Gaunt, Duke of Lancaster, longs to return home to France. Having fought in the ranks of the now disbanded papal armies in Italy, he finds himself penniless and stuck in a foreign land far from his native Avignon, with only a resentful and unscrupulous debt collector as companion. Above all, though, Geoffrey fears losing his place at court, and so he must make his way back to the halls of Gaunt or risk being forsaken by the only family he has known. Twelve-year-old Niccolo, the new marquis of Ferrara and heir to the strategic lands of the Este family, is under siege. His right to the throne is being contested by his uncle. Outnumbered and insecure because of his questionable legitimacy, Niccolo must gather an army of his own. When the paths of the errant squire and troubled marquis cross, their fates intertwine as each endeavors to take from the other what he needs. Before picking up Of Fathers and Sons I'd never heard of the Italian House of Este so forgive me, but much of my admiration for this piece stems from history that came to life under under Evan Ostryzniuk's pen. I can't imagine what a daunting task recreating the late middle ages is for a fiction writer, but Ostryzniuk manages it well, balancing the atmosphere and political tension against the culture and feel of Italy in the late 1300s. It seems pompous to say so considering I am so far removed from the period, but the piece has an authentic feel to it and was obviously created by someone with a deep respect for both the history he writes and the craft of storytelling. Of course, fiction isn't just about setting is it. A good story needs good characters and here again Ostryzniuk did not disappoint, his leads being both historically appropriate and emotionally compelling. The young Niccolo d'Este was easy enough to like, but I dare anyone not to have sympathy for a boy in his situation. Geoffrey on the other hand is absolutely fascinating. I can't help being drawn to these kinds of characters, the ones written in shades of grey, that don't cater to a simplistic labels of good or bad, right or wrong. I was pleasantly surprised to discover such a character here. As I said I wasn't overly familiar with politics so I did find myself referencing quite a few details, but I want to make it clear my research has nothing to do with Ostryzniuk's writing. Events are more adequately explained within the narrative so don't be intimidated, I'm just obsessive, especially when presented with historic material I've not previously encountered. All in all, a solid fiction that will prove particularly interesting to those interested less well known chapters of history. Are you expecting the war to come to you? I am no condottiere, but I am certain such things do not work that way. House of privilege, riches and secrets... Wentworth is today and crumbling and forgotten palace in Yorkshire. Yet just a hundred years ago is was the ancestral pile of the Fitzwilliams - an aristocratic clan whose home and life were fueled by coal mining. 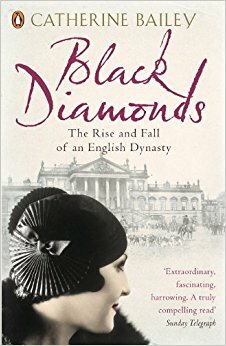 Black Diamonds tells of the Fitwilliams' spectacular decline: of inheritance fights; rumors of a changeling and of lunacy; philandering ears; illicit love; war heroism; a tragic connection to the Kennedys; violent death; mining poverty and squalor; and a class war that literally ripped apart the local landscape. The demise of Wentworth and the Fitzwilliams is a riveting account of aristocratic decline and fall, set in the grandest house in England. Catherine Bailey's Black Diamonds presents quite a challenge for me as a reviewer. In terms of content this piece is a treasure trove of information, but the formatting and haphazard construction make it an incredibly difficult piece to digest. For the record Bailey does not cover the rise of the Fitzwilliams. She takes great liberties assuming the reader is already familiar with the family and entirely omits the early chapters of their history without so much as a footnote of explanation. The title was created in 1716, but Bailey's chronicle doesn't begin until 1902 with the death of the 6th Earl Fitzwilliam leaving much of the family, not to mention the origins of their wealth and influence, shrouded in mystery. This omission, however, is only the beginning. The biographical preface is followed immediately by an emotionless tour book style introduction illustrating the present day appearance of the house and surrounding grounds. Chapters 1 through 3 see a return to the biographic tone with a focus on William "Billy" Wentworth-Fitzwilliam, 7th Earl Fitzwilliam and the legal difficulties he struggled with coming into his inheritance and thoughchapter 4 retains the same voice, it makes an abrupt departure and jumps back to 1839 for the birth William Wentworth-Fitzwilliam, Viscount Milton, to examine the life of Billy's father. Much to my annoyance, this erratic timetable is continued throughout the book. To make matters worse Bailey seems to have had more than a little trouble determining the exact scope of her work. The description led me to believe this was a family history, but within the text, the personal lives and accomplishments of the Fitzwilliams frequently fell to the way side as Bailey examined the coal mining industry, class conflict and the political upheaval that characterized England in the early and mid 1900s. Though I found the information intensely interesting, I often found myself wondering how the work of a pit pony and his adolescent driver or the breakdown of a coal miner's household budget impacted the inhabitants of Wentworth. I probably don't need to illustrate my point any further, but the most glaring departure of the book takes place between pages 332 and 379, a span in which Bailey devotes nearly fifty pages to Kathleen Kennedy, sister of future president John F. Kennedy. I understand her appearance here considering her tragic death alongside Peter Wentworth-Fitzwilliam, 8th Earl Fitzwilliam, but these pages aren't about their affair. The two don't even meet until page 380. No, this section details her life as a debutante, as daughter of the American Ambassador, her career with the Red Cross and the personal trials she suffered during her relationship with William Cavendish, Marquess of Hartington. It is fun information, but entirely superfluous in the history of the Fitzwilliams. Do I think the book is a waste? Not at all. Bailey presents a wealth of wonderful material in these pages, much of which I'd never before encountered. In terms of content, I loved this piece, but that being said I would have liked to see more coherency in the final product. The story starts at the edge of the void; at the moment when the official history of Wentworth house stops. London, 1940. Winston Churchill has just been sworn in, war rages across the Channel, and the threat of a Blitz looms larger by the day. But none of this deters Maggie Hope. She graduated at the top of her college class and possesses all the skills of the finest minds in British intelligence, but her gender qualifies her only to be the newest typist at No. 10 Downing Street. Her indefatigable spirit and remarkable gifts for codebreaking, though, rival those of even the highest men in government, and Maggie finds that working for the prime minister affords her a level of clearance she could never have imagined—and opportunities she will not let pass. In troubled, deadly times, with air-raid sirens sending multitudes underground, access to the War Rooms also exposes Maggie to the machinations of a menacing faction determined to do whatever it takes to change the course of history. Ensnared in a web of spies, murder, and intrigue, Maggie must work quickly to balance her duty to King and Country with her chances for survival. And when she unravels a mystery that points toward her own family’s hidden secrets, she’ll discover that her quick wits are all that stand between an assassin’s murderous plan and Churchill himself. I am so disappointed Susan Elia MacNeal's Mr. Churchill's Secretary didn't work for me. It looked like such perfect fit - a mystery set against my favorite historic event, but try as I might I just couldn't get into this one. Part of the problem was the tone in which the story is written. Despite taking place in London during 1940, the characters seemed detached from monumental events taking place around them. They were too unconcerned, too passive, too indifferent. Even when bombs were falling from the sky the tension one might expect from those living in the shadow of the blitz just wasn't there. I also found it incredibly difficult to appreciate heroine Maggie Hope. Her views were too modern and she was entirely too outspoken for the period. Her demeanor and thought processes grated my nerves something terrible, often leaving me annoyed with her and disgruntled with the story in general. My biggest issue, however, was that the book felt distinctly American. The British have a much different manner about them, their society follows different rhythms and I don't think MacNeal was at her best in recreating them here. As usual, I refuse to allow a single installment to turn me off a series, but I will certainly be approaching book two, Princess Elizabeth's Spy, with a degree of caution. Maggie drew herself up in her straight-backed wooden chair and lifted her chin. I'll show you, she thought. I'll show all of you. "I'm ready for anything Ma'am." I wish I could say I came across this title of my own accord, but I must confess, it was Ni Ni's performance in the film adaptation that prompted me to track down a copy Geling Yan's The Flowers of War. For those whose history is a little rusty, the Nanking (Nanjing) Massacre took place in December 1937. Estimates vary depending on the source, but the International Military Tribunal of the Far East claim more than 200,000 civilians and military personnel lost their lives to the soldiers of the Imperial Japanese Army. It is in my opinion, one of the darkest and oft overlooked chapters of WWII. I would have been attracted to this piece even if I'd never seen the film. I'd never come across a fictional version of the event and couldn't help being intrigued by the idea once I had. I wanted to see how a writer would treat the event, how they would go about constructing a story from the ashes and sorrow it left in its wake. In this regard, Yan has real a gift. Her work gives faces to the victims of Nanking and voice to their silent tongues. Through the fiction experiences of Shujuan, Yumo, Hongling, Cardamom, Wang Pusheng, Major Dai, Father Englemann and Fabio, Yan tells the human side of war, weighing emotion and sentiment against the stark reality of history. The Flowers of War is a plainly written piece, but no less moving for its simplicity. In point of fact I found the modest language and style of the piece one of its more attractive qualities not to mention highly appropriate to the rather bleak subject matter. Finally, I would note that for all the similarity this is not the same story director Yimou Zang tells on film. Be prepared for that and try to judge each format in its own right. As Yumo's eyes met Shujuan's, Shujuan looked away. She didn't feel that hot hatred. Instead what she felt deep down inside was an echoing wonder. Flashlight Commentary is pleased to offer readers the chance to win free copies of Ben Kane's Spartacus: The Gladiator and Spartacus: Rebellion! Historically very little is known about Spartacus. We know that he came from Thrace, a land north of Greece, that he once fought in the Roman legions and that, during two fateful years, he led a slave army which nearly brought Rome to its knees. In Ben Kane's brilliant novel, we meet Spartacus as he returns to Thrace, ready to settle down after a decade away. But a new king has usurped the throne. Treacherous and violent, he immediately seizes Spartacus and sells him to a Roman slave trader looking for new gladiators. The odyssey has begun which will see Spartacus become one of the greatest legends of history, the hero of revolutionaries from Karl Marx to Che Guevara, immortalised on screen, and now brought to life in Ben Kane's great bestseller - a novel which takes the story to its halfway point and is continued in Spartacus: Rebellion. Giveaway limited to the US and Canada. I rarely find Ancient Roman fiction that falls in the grey. I mean I either fall completely in love with it or absolutely despise it. Funny thing is it really comes down to the author and whether or not they can make me believe their perception of the ancient world. In picking up Spartacus: Rebellion, I knew I needed to hear the roar of battle in my mind, see the grit, sweat and blood of each warrior on the field, feel the desperation and conviction amid the violence and savagery of war. If I'd had any experience with Kane's work I would have known going in he would meet every one of these expectations, but as a first time reader, really, I had no idea what I was getting myself into. Now, I don't want to give the impression that the book is all blood and gore as that would be an egregious misrepresentation. I needed those scenes to work, but I loved how Kane balanced them against the politics of it all. His incarnation of Spartacus is prone to human faults, acting in arrogant self-importance and in so doing, undermining his own authority. It is a very dynamic portrait of the gladiator which is quite an achievement when one considers how little Kane had to work with historically. If anything, I wish I'd read the first installment before taking on the sequel. You can enjoy Spartacus: Rebellion as a stand alone, but I think I might have appreciated it more if I had a better grasp of the larger scope of Kane's story. Still, Spartacus: Rebellion is a realistic and remarkably well-researched fiction by a truly gifted storyteller. A definite must-read for anyone interested in the gladiator or his achievements. This is the story of Kathleen Kennedy and her struggle to live her own life her own way, in spite of enormous pressures from her parents and the rest of the clan. She first went to England in 1938 when her father, Joseph P. Kennedy, became the Ambassador to the Court of St. James. She made her debut that year and was selected as the most popular debutante of the season. Her story falls into two parts: her forbidden marriage to the Marquis of Hartington, son of the Duke and Duchess of Devonshire; and her fatal affair with Earl Peter Fitzwilliam, one of the wealthiest men in Britain, who was already married to the heiress of the Guiness Fortune. Through World War II, and a few of the post-war years, we watch the tragedy unfold. In an ideal world, book reviewers would attempt to say something nice about every book they review, but I find the most positive thing I can say about Robert DeMaria's That Kennedy Girl is that the author made an excellent choice of subject matter. As to DeMaria's work, am I bitter that I wasted my time on such a poorly written piece? Am I upset at the paper thin characterizations? Am I annoyed at the incohesive construction? Am I dismayed by the continued references to Kathleen's time in England before the war and the complete lack of information DeMaria actually gives the reader about that part of her life? Am I concerned that the book, on more than occasion, drifted to the carnal exploits of Joe Jr. and Jack rather than staying focused on Kathleen? Yes. Yes I am. Okay, not my best commentary, but reflecting on this piece is truly upsetting and though I've given honest effort to penning something that better illustrates my experience I find I cannot subject myself to this torture a moment longer. Suffice it to say as both a reader and someone with a genuine interest in Kick, I was brutally disappointed by this book. Obviously not something I can bring myself to recommend, but if your curiosity must be satisfied, I would strongly suggest requesting from your local library. The Kennedys, of course, were not ordinary. It seemed to Kathleen that she knew this from birth. And that she was reminded of this fact every single day of her life either by her parents or by the echo of their voices, an echo that said that the Kennedys were born to win. Thomas De Quincey, infamous for his memoir Confessions of an English Opium-Eater, is the major suspect in a series of ferocious mass murders identical to ones that terrorized London forty-three years earlier. The blueprint for the killings seems to be De Quincey's essay "On Murder Considered as One of the Fine Arts." Desperate to clear his name but crippled by opium addiction, De Quincey is aided by his devoted daughter Emily and a pair of determined Scotland Yard detectives. In Murder as a Fine Art, David Morrell plucks De Quincey, Victorian London, and the Ratcliffe Highway murders from history. Fogbound streets become a battleground between a literary star and a brilliant murderer, whose lives are linked by secrets long buried but never forgotten. A few weeks ago a friend came over for dinner and seeing me sprawled out on our couch, book in hand, astutely asked what I was reading. A slow smile crept across my lips as I considered my response. I had to be careful. I was hanging on every word of the deliciously dark historic thriller, in love with every lurid detail, but how best to explain my enthusiasm for a book on sadistic serial killer left me in a bit of fix. The book in question was David Morrell's Murder as a Fine Art. Now, having finished the piece and struggling to do it justice in a review, I find myself in much in the same position. Should I gush over the historic details that placed me square on the gas lit cobbles of nineteenth century England? Should I exclaim over his wonderfully dynamic if flawed and morally ambiguous cast? Or should I just bow to Morrell's genius as the author of such a titillating, white-knuckle opus? Quite a quandary, is it not? Admittedly, I loved the story, but I can't get over the feel of this piece. I have no knowledge of the research that went into its creation, but I'm convinced Morrell exerted considerable effort in this regard. Cover to cover I merely had to close my eyes and I was there, right there on the dingy streets of Victorian London, trailing the sweet smelling coat tails of Thomas De Quincey. I'll grant I have a rather vivid imagination, but even so, I found the period descriptions in this piece a particular treat. A palatably rich meditation of evil, plush with historic detail, dark and dangerous as the Victorian slums, Murder as a Fine Art is a brilliantly crafted, fast-paced, must read murder mystery. Does a great work of art require a great subject? Does the murder of a queen create a grander impact than that of a common person? No. The goal of the art of murder is pity and terror.